"The book shifted my perspective on the definition of abundance, or rather highlighted that abundance should not be held to a definition, at all, this is honestly a game-changer. The journaling prompts are so helpful, even if just because they forced me to put pen to paper on things that may have previously existed in my mind, but the act of physically writing them created a sense of accountability in itself. I may need to read it annually (or more) just to hold myself accountable. With each chapter it builds on the framework, while simultaneously picking away at the existing belief systems that so many of us are living “stuck inside of.” This book is concise, practical, actionable, relatable, loving, and motivational, everyone needs it." I created this book for those who have been called to make a bigger impact and the income to match, the passionate soul on a mission who is here for more, but feels stuck and overwhelmed when thinking about how to create momentum and more abundance in their lives. Master Your Money Mind is a game-changing guide to transforming your mindset and daily habits around how you think about yourself and money. Many will teach you about the power of the mind as it relates to money, but few will dive in to the daily habits, rituals and exercises that will transform the entirety of your life, not just your bank account balance! Use your words to attract more money. Apply the MYMM Equation to change your life + career. Get crystal clear on what’s blocking your abundance. Uncover your Money Memory Lane timeline. Create a daily money mindfulness practice. If you're like me, the word money has been code for stress. There was quite enough growing up and that money stress translated in to my parents working tirelessly to make ends meet. As a small child, I made it my mission to figure this money thing out, to not only create more freedom for me, but for the people I love the most. In 2004, I started my first job out of college for $20,000 per year and no benefits. I felt like I was RICH! But over the course of those ten years in my corporate career, I realized how long it was going to take to make the kind of income that I was dreaming about. I knew that there had to be MORE than working 40-50 hours per week for a paycheck that had no capacity to change until it was time for another promotion. When this lightbulb went on, I started diving head first into the world of personal development, studying the millionaires and a success stories that captivated me. I read their books, listened to their podcasts, went to their seminars whenever I could find the time in my full work schedule to L E A R N.
Through this work and launching a business that has brought in seven-figures over the last 4 years and completely transformed our lives. 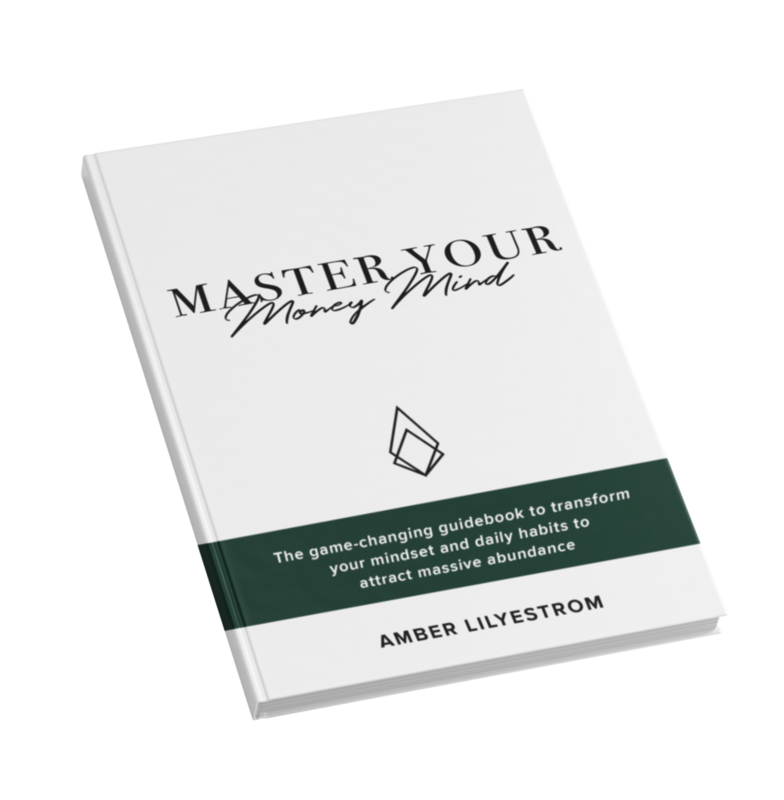 What I learned is that the game is changed in our MINDS and in this booklet, I share with you the way to transform your mindset to align with the money you're ready to welcome in to your life. This booklet is filled with powerful stories and exercises for you to apply right away. I break down the patterns you've likely been practicing that are keeping you stuck and unable to move forward with your money mindset and with what's coming in to your bank account every week. This booklet is just $9.99 and as my gift to you, no matter where in the world you live, I am throwing in shipping for FREE. No questions asked, no catches, for less than 10 bucks you can implement the teachings of this book and change your life. IT’S TIME TO shift your money mindset, my friend. Because every morning you wake up feeling stuck and frustrated and not living in your true purpose is impacting the world, most especially the people you are doing your life with. Just last week, we took a Wednesday off from working in the business to bring our daughter to an amusement park. My mom had the day off from work and she joined us....and the laughter and the joy that we got to witness...the MEMORIES we got to make that day will stay with us for the rest of our lives. I didn't have to ask for the day off, I didn't have to take a cut in pay, in fact, I made over $2,000 while at the amusement park that day...is what I wish for each of us. When I launched my business, the primary reason was because I wanted to be more present for my life and the people in it. What I share with you in Master Your Money Mind will help you transform your relationship with money and with what's possible for your life. I can't wait to see what comes next for you. "I had a negative relationship with money throughout most of my life, and changing that story is something I'm consciously working on all the time. Even though I've read a ton of books and make huge changes up to this point, I'm always hungry for more. So I was excited to delve into Amber's book and make some changes, which I thought would be small, because i thought i had made the "big" shifts - out of debt, doing what I love, etc. But wow! First, I was able to pinpoint what is TRULY important to me by doing some of the exercises. Then when I got to the chapter about the Wisdom in Our Words, I had a huge shift. While I have a "good" relationship with money, I definitely fall into negative thinking. Negative words. So here's the image I used to explain this in my own head. I used to have a dark cloud and pouring rain over me all the time around my relationship and mindset with money. And now it doesn't rain on my parade. But the clouds come in every day - making it had for me to see what's ahead. I see way better in full sunshine - and I know I can stand in that sun all the time now. I actually don't have to "accept" the clouds, because they aren't mine. They are there as a distraction from the sunshine that is supposed to be shining on me so I can spread that sunshine and love to others. There are so many more takeaways that I could go on for pages, but this is the one that truly stood out for me.Thank you, Amber, for helping me see that my mindset around money really, truly can be mastered and i can stand in the sunshine every damned day. I'm so grateful for this beautiful gift - thank you, sister!" My guarantee to you is that these exercises, when implemented, will make a difference in your life. I know when you take action, you’ll get results. These are the reframes I have followed to transform my life, give in my community, serve my family and friends and touch the lives of thousands of visionaries like you all over the world. AMBER LILYESTROM is transformational branding & business strategist, author and speaker. She has been featured in Entrepreneur and Working Mother Magazine and is the host of The Amber Lilyestrom Show podcast and helps entrepreneurs turn their passions in to heart-centered brands and thriving businesses. Amber supports visionaries, leaders and disruptivators in changing the world and their lives through live event experiences, mindset coaching, online coaching programs and masterminds. Amber spent 10 years working in collegiate athletics marketing, managing the University of New Hampshire Wildcats brand, as well as teaching sports marketing and mentoring student interns. She was recognized as one of the top sports marketing professionals in the nation and was also the solo captain of her D1 collegiate women’s soccer team. She lives with her husband and retired police officer Ben and their daughter in their lakefront home, homeschooling and adventuring in nature with their sweet pup.